Search engines like Google have one main job: to serve up relevant search results. In order to keep up with the latest technology (like smartphones) and consumer needs (high-quality, targeted, local search results), Google is continually improving the algorithms it uses to rank website content. This is great for consumers but makes things a bit more complicated for a local business trying to get found online. These frequent Google algorithm updates mean SEO best practices are always changing. Although it’s impossible to predict Google’s next move with 100% certainty, there are steps businesses can take to future-proof their web presence as much as possible against upcoming algorithm updates. Google wants to deliver the most relevant results to its users, which means providing specific, targeted content that matches a search query perfectly. Businesses that offer valuable content that Google can easily identify will perform well as the search giant gets better and better at distinguishing high-quality E-A-T content from low-quality content. Each page of a business’s website should serve a specific purpose and each blog post should answer a specific question. Focusing on topics that matter to local consumers when possible is the best way to ensure Google will continue to serve the website to nearby customers when searching. Businesses that ensure their location details are identical across all major business directories, their website, and social media profiles are more likely to rank higher in search. Maintaining accurate NAP data (name, address, and phone number) is an important part of optimizing a website for local search. Not only do inconsistencies hurt a business’s SEO and local search placement, but all signs point to Google continuing to prioritize local results for mobile consumers. I’m sure you’re tired of hearing about mobile, but the simple fact is mobile devices are not going away and Google’s new divided index displays separate search results for mobile and desktop users. As the mobile index continues to gain authority, it will be prioritized over the desktop index and receive more frequent updates. In future algorithm changes, Google will continue to reward websites that perform well on mobile devices. Not only is a mobile-friendly website the new norm that consumers expect, it’s also necessary for ranking well on search engine results pages. A website should be designed with mobile users in mind going forward. There are small Google algorithm changes rolling out all the time – many so subtle that you don’t even notice! But that doesn’t mean you can let your guard down. Business owners need to be ready to react and adjust their SEO strategy accordingly whenever the next big update is revealed. According to https://chriswyattseo.com/ the best defense against algorithm changes is to keep up with the latest SEO best practices. Remember to take the time to consider how any changes you make might impact a customer’s online experience. Stay vigilant about local presence management and keep an eye out for new algorithm updates so you can respond as quickly and effectively as possible. Are you prepared for the next big Google algorithm update? This free resource will get you started. Be sure to come back each week for more local SEO strategies from the #QueenofLocalSEO. 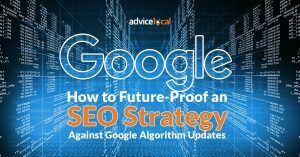 The post How to Future-Proof an SEO Strategy Against Google Algorithm Updates appeared first on Advice Local.